Kirsten wanted to develop a new wet play-and-learning area for the children, and asked if we could provide any pipes or guttering. A quick trip around our sites, and one lorry load of everything from mains pipes to guttering was delivered last week, which the children seemed fascinated with! Kirsten explained why it was such a useful addition to the school's play and learning facilities. "We've always had a water feature inside, and it's always popular, so we wanted to expand on that by taking the wet play area outside, enabling us to expand on the range of uses and learning opportunities. This new area helps children in so many ways, including speaking and listening skills, imagination and working together. The pipes and guttering so kindly provided by Hartford are perfect for this, and for problem solving in how to connect the pipes. It's going to be really helpful and we can't wait to start using the new area." 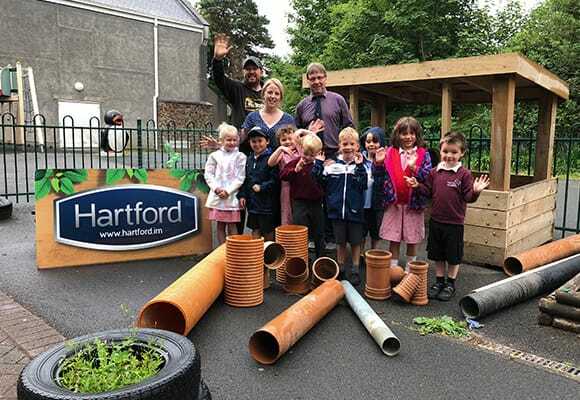 Keith Featherstone, one of our Project Managers and John Boardman, one of our drivers, delivered the pipes and stopped for a quick photo with Kirsten Evans and some of the children from Laxey School. We hope you all have great fun and we love seeing such a unique way of using materials that we're more used to putting in the ground!